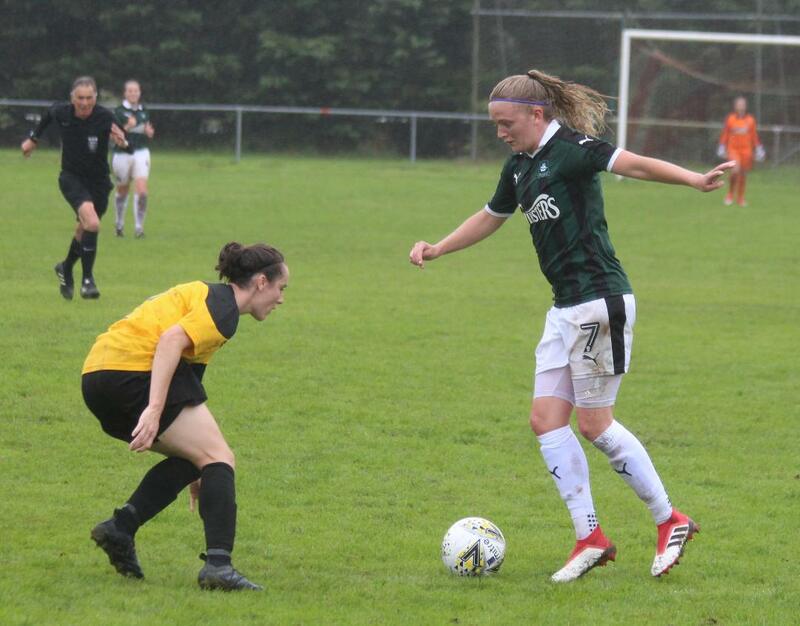 Plymouth Argyle Ladies are back on the road again on Sunday when they travel along the south coast to play Southampton Women in the second round of the National League Cup. Argyle had a successful cup run last season beating Cardiff City 2-1 and Chichester City 3-1 before going down 3-0 at home to Coventry United. They also beat Southampton 7-1 at home in the league last season before drawing the away game 2-2 thanks to a late Zoe Cunningham equaliser which clinched the Pilgrims promotion to the Southern Division. Southampton have won all five of their league matches to date but suffered a shock 2-1 home defeat to Marine Academy Plymouth in the FA Cup so will be keen not to go down to another team from the city. Argyle are still without top scorer Natasha Knapman through injury and now Welsh international Helen Bleazard (pictured) is also carrying a knock and will be monitored before the match. With her fitness in doubt the Pilgrims have called up Tamsin Medd-Gill to the squad as cover. The management team were pleased with the team’s performance last week in winning the Dockyard Derby at Portsmouth, especially producing their first clean sheet of the season. Possible Argyle squad: Lindsay Rogers, Darcey Hepworth , Mollie Taylor, Kate Middleton, Rebecca Wakely, Zoe Cunningham, Rebecca Dandridge, Kayley Lane, Helen Bleazard, Jessica Jones, Amber Pollock, Steph Beck, Ebony Dover, Faye Ivall, Tamsin Medd-Gill. Meanwhile, Argyle Ladies have signed Greek under-20 international defender Panagiota Papaioannou. Papaioannou signed for Northern Division outfit Guiseley Vixens in November last year and played six times for them. The young Greek international started her career at Kavala 1986, in the second tier of Greek Women’s football. In 2014 she moved to Vasilissa Tis Thrakis of the same league where she played for three years. In the first year of her career she had her first training session with the under-17 Greek national team and since then has taken part in three European qualifying tournaments. Papaioannou moved to Plymouth to study sports science at Plymouth University and wrote to the club asking for a trial. She has spent a couple of weeks training with the club and joint first team manager Dave Leonard spoke to development team manager Rob Bonney after training on Wednesday and said he has been impressed with her in the coaching sessions but he would like us to have a look at her in a competitive environment. She is set to feature for against Bideford on Sunday in the development team’s South West League Western Division at Salt Mill (2pm). Injury woes continue for the development team. Although Shania Fenlon returns after missing last week’s game through injury, out go Morgan Friend (knee) and Kelly Vinnicombe (Hip). Also missing this week are Nicola Champion and Kiara Robins. The development team can take a big plus out of last Sunday’s 1-1 darw at Alphington. Although there were below par, their battling qualities saw them secure a valuable point. Argyle Development squad: Amy Darnley, Hannah Brock, Gabi Alphous, Maya Ridge, Rachel Javan, Vicki Fannon, Alex Hugh, Sally Salter, Becky Parkyn, Jodie Randall, Shania Fenlon, Charlie Rollerson, Panagiota Papaioannou.